The Summer Triangle rises in the northeast this month. The Triangle is what astronomers call an asterism, an unofficial grouping of objects, often geometric, that isn’t a true constellation. Instead, the Triangle connects three major constellations in a triad of bright stars. 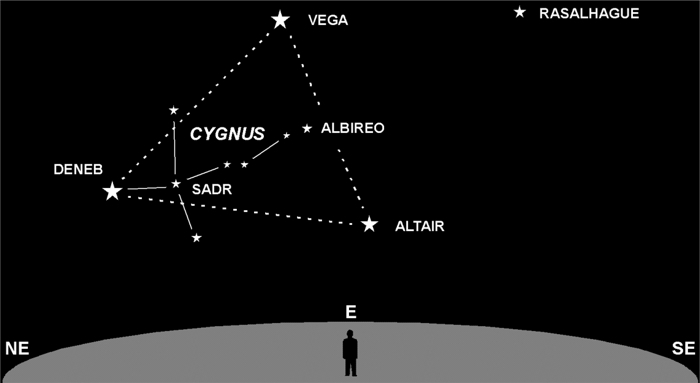 The brightest is Vega, part of the constellation Lyra. Next is Deneb, the tail of Cygnus the Swan. Dimmest, due to its lower elevation, is Altair, the eye of Aquila the Eagle. These are, respectively, the 4th, 16th, and 9th brightest stars in the sky. You can’t miss it. We say the Summer Triangle is “rising” since it appears for the first time, after sunset, each year in early Summer. As the days go by it will drift west at a rate of 1° per day, completing its 360° circuit around the sky in exactly one year. On this date, one year from now, the Summer Triangle will be in exactly the same position. This westward drift is shared by all constellations. It’s a result of Earth’s orbital motion around the Sun and the changing direction of night. You can follow the Triangle for the next six months. By late December it will have drifted so far to the west that it’ll set at the same time the Sun rises. Each season has a prominent constellation, or asterism. Recognizing these patterns helped early humans anticipate the annual cycles of nature.